Take your summer time denim to a new level with embellishments and the proper amount of rips. Yes, ripped jeans can make you feel a bitter cooler during the summer months. Denim Skirts - denim comes in various weights and colors. 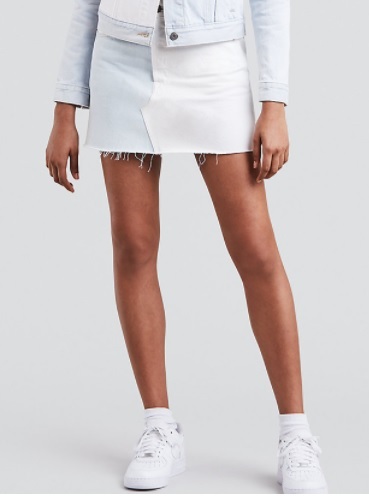 Pick a skirt made of light weight denim. Using light colors has creates a sense of coolness (in theory). Short skirts - short skirts have less fabric. Therefore, they must be cooler than wearing a full length skirt. Levi's iconic 501® Jean is the one that started it all, and continues to evolve with you. These are made using our WaterLess® techniques. Every drop counts, so we aim to use less water. Our designers are constantly thinking of new ways to create the same styles you love while cutting back on H2O, such as updating finishing techniques to require less water than traditional processes. Button fly - is it possible that button fly jeans keep you cool because they are not fully zipped shut? Probably not, but possibly a little. 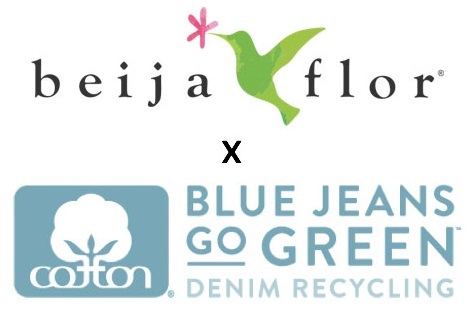 Learn more about button fly jeans if you are curious. 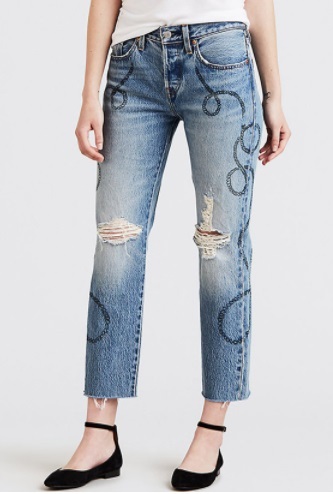 Learn more about ripped jeans & embellishments here on Apparel Search. What is the best top for summer months? Well, can't tell you the exact type of top that would technically be the best. That really depends on the occasion. However, I can tell you that the tank top is a versatile option for summer fashion. Tank tops can be worn to the gym or for a night out on the town. Pictured above is the Ashbury Tank Style #391900004 from Levi's. This scoop-neck tank has a slouchy look that pairs easily with your new jean shorts or favorite denim skirt. 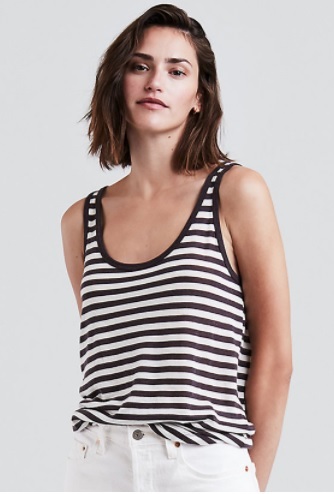 Tank tops can be for exercise and sweat but as you can see with the stripes above they can be casually chic as well. Learn more about tank tops. They are clearly a great choice for warm weather. When discussing how to dress for summer, it would be a crime if we did not mention t-shirts, capri pants, denim jean shorts,, etc. You can learn more from the following links. We hope above helps you better understand how to dress for summer for 2018 and beyond. All of the above pictured fashion can be found at the Levi's website. Levi's can teah you how to dress for summer, spring, fall or winter. Enjoy. Oh, almost forget. Don't forget to learn more about swimwear. Obviously, an extremely important summer fashion item. And one more thing before I go, just wanted to remind you to wear sunscreen. It is important to protect your skin from the harmful rays of the sun. Harmful Effects of Ultraviolet Radiation - The harmful effects from exposure to ultraviolet (UV) radiation can be classified as acute or chronic. The acute effects of UV-A and UV-B exposure are both short-lived and reversible. These effects include mainly sunburn (or erythema) and tanning (or pigment darkening). The chronic effects of UV exposure can be much more serious, even life threatening, and include premature aging of the skin, suppression of the immune system, damage to the eyes, and skin cancer. Wearing a swim shirt to the beach and sunhat might be a good idea as well.